Do you know Pete the Cat? He recently joined us for some of our children’s events and he was a big hit with the kids. Each event started off with reading ‘Pete the Cat I Love My White Shoes’ ~ with everyone’s favourite part: Julie acting out the role of Pete!! 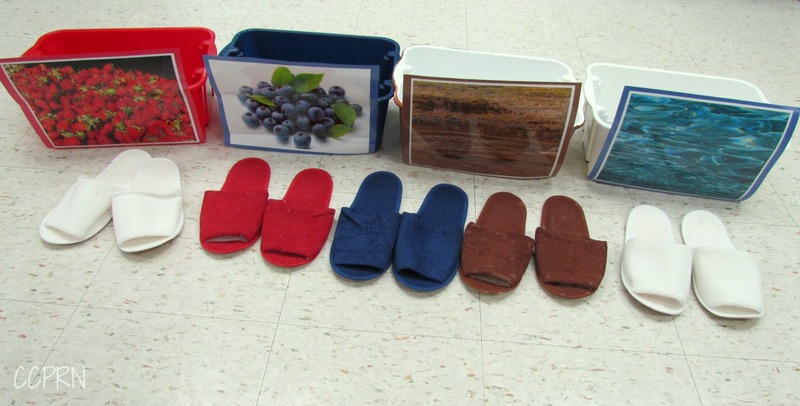 She placed different coloured slippers into 4 different coloured buckets, each with a different picture on it – one of strawberries, one with blueberries, another with mud and of water. When the story began, Julie was wearing a white pair of shoes (slippers from the dollar store). As the story progressed, she would step into the buckets and slip off one pair of slippers and replace it with another. So to the children, it appeared that her slippers changed colours! Later, the buckets were used again for another activity. 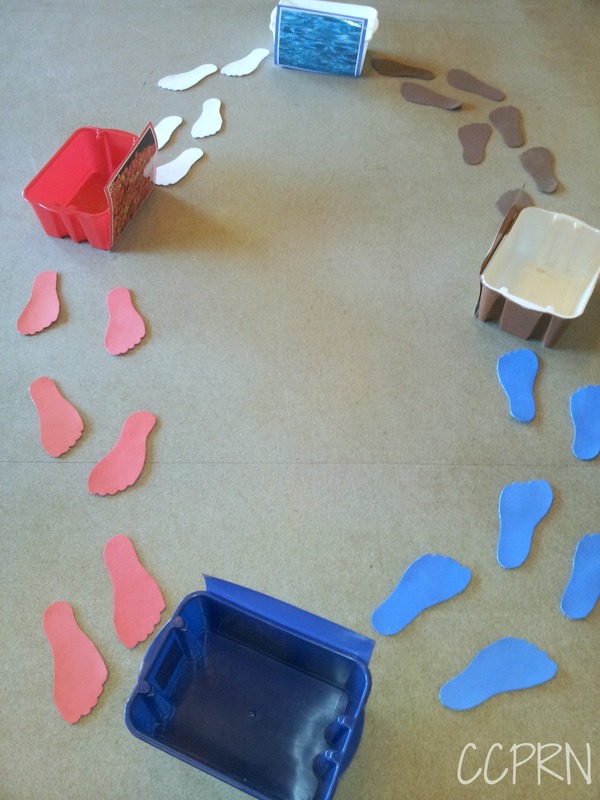 The slippers were replaced with grippy footprints on the floor and the children practiced their gross motor skills by following them along and carefully stepping in and out of the buckets. Julie made this large Pete the Cat as a prop, and held up number cards as Pete’s buttons popped off. Then, of course, when Pete lost all of his buttons…. …he flaunted his belly button. 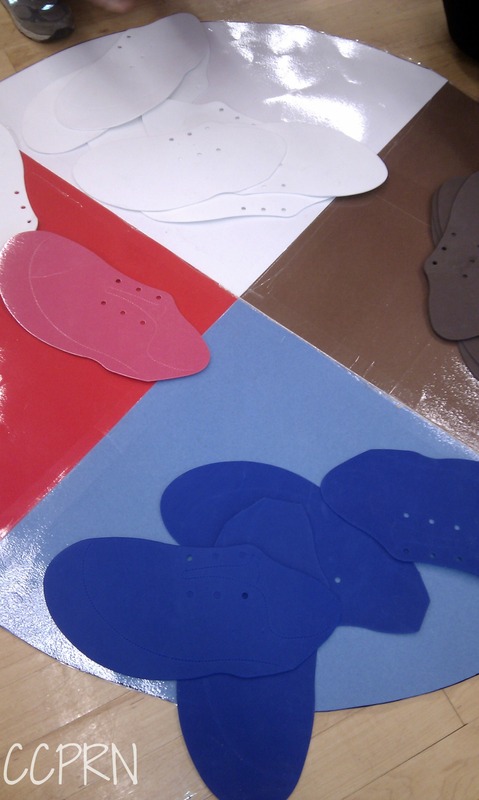 A colour-match wheel where the children matched the coloured shoes to the colours on the wheel. 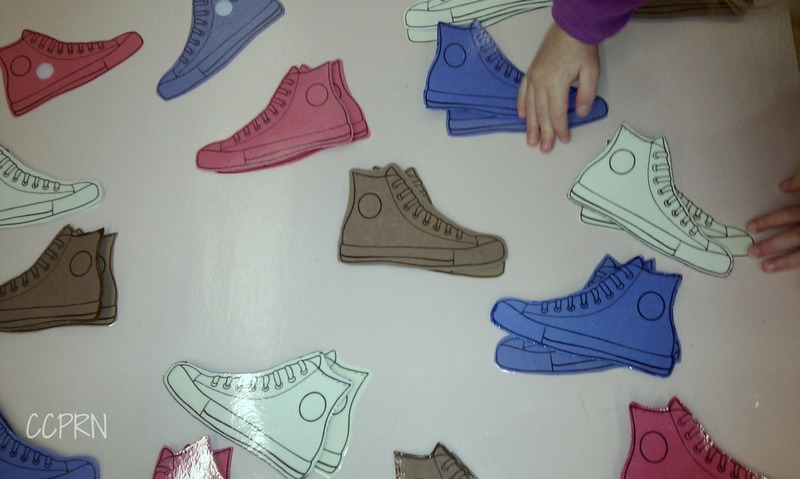 We added a gross motor component by placing the shoes and the wheel at opposite ends of the room so that the children would have to bend down to pick up a shoe and walk over to the wheel to place it on. 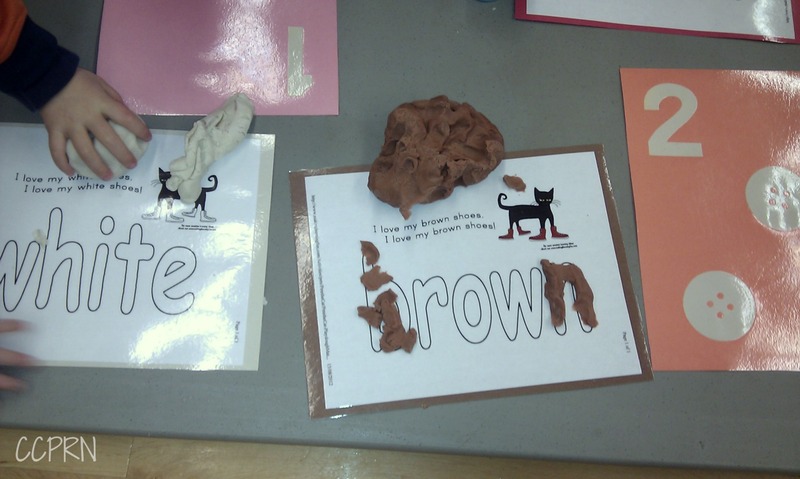 All of these activities were created as extensions to a favourite book. The learning comes naturally when you’ve got a child’s interest already! You end up with ‘planned’ curriculum instead of ‘canned’ curriculum (as described by Monique at the E.L.E.C.T. training earlier this month). We’d love to hear about any activities you’ve developed around a treasured story.